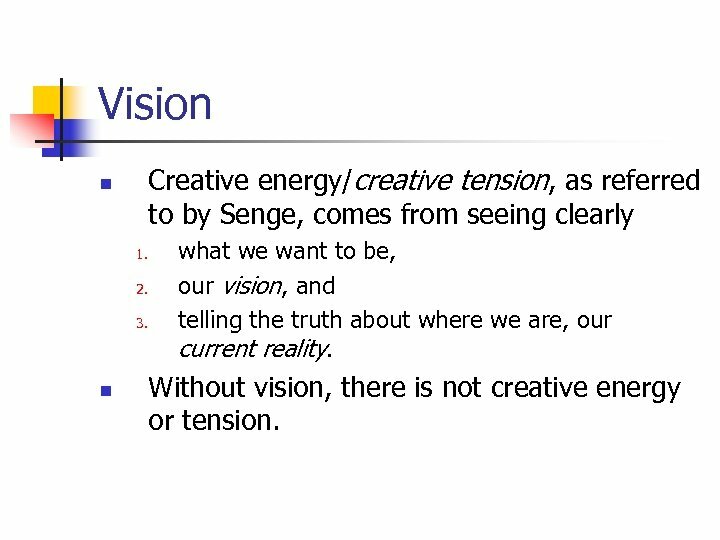 Vision Creative energy/creative tension, as referred to by Senge, comes from seeing clearly n 1. 2. 3. n what we want to be, our vision, and telling the truth about where we are, our current reality. Without vision, there is not creative energy or tension. 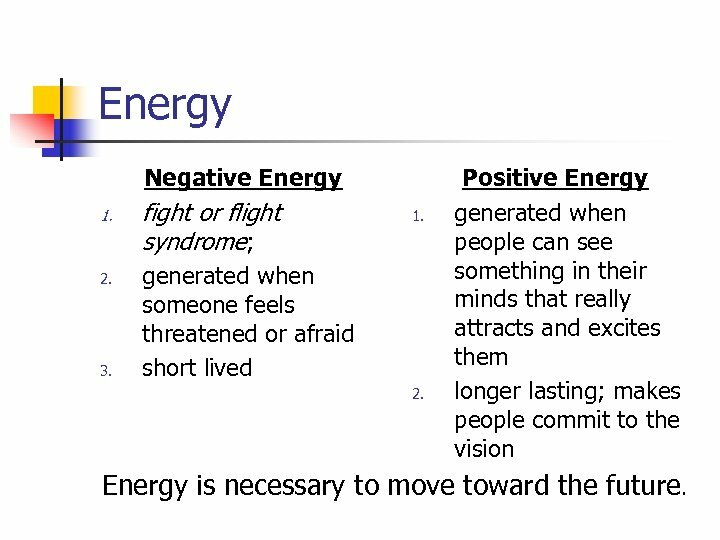 Energy Negative Energy 1. 2. 3. fight or flight syndrome; 1. generated when someone feels threatened or afraid short lived 2. Positive Energy generated when people can see something in their minds that really attracts and excites them longer lasting; makes people commit to the vision Energy is necessary to move toward the future. 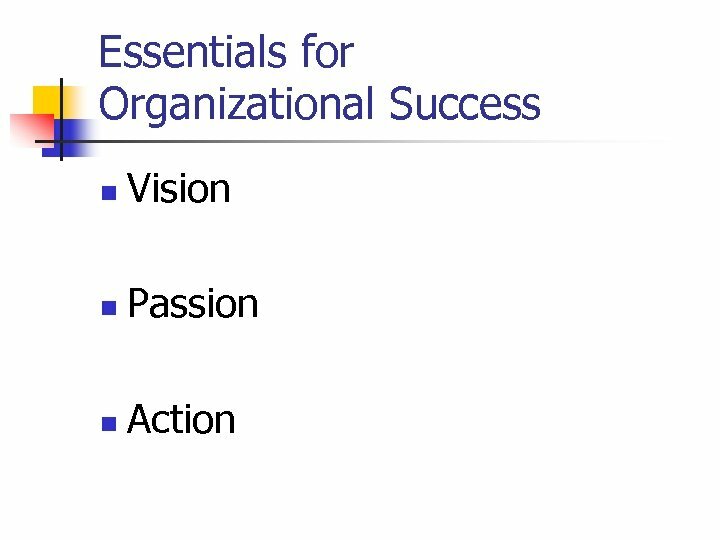 Peak Performing Organization n Requires that each member see in the shared vision something that attracts their full interest and desire. 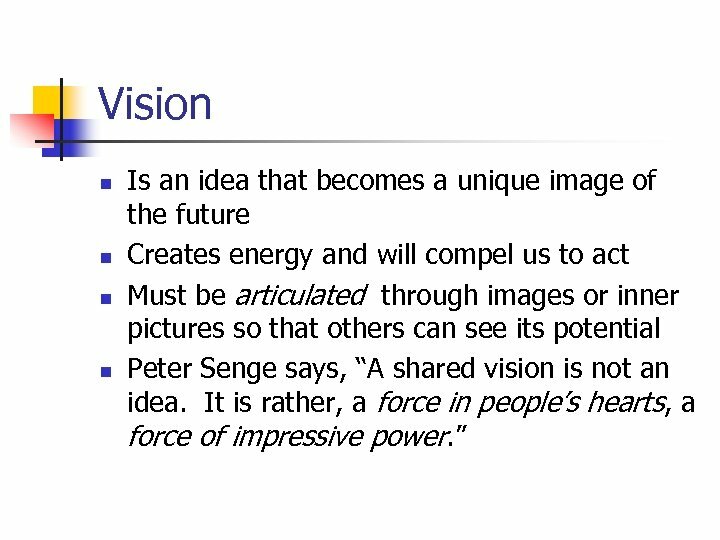 Perceptions of the vision may not be exactly the same. When the visions are overlapping and interwoven, the “energy vectors” form a cone. 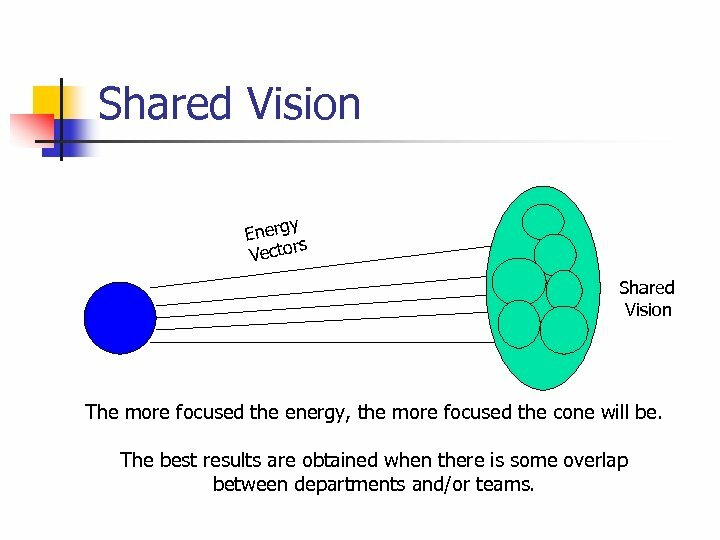 Shared Vision y Energ rs Vecto Shared Vision The more focused the energy, the more focused the cone will be. 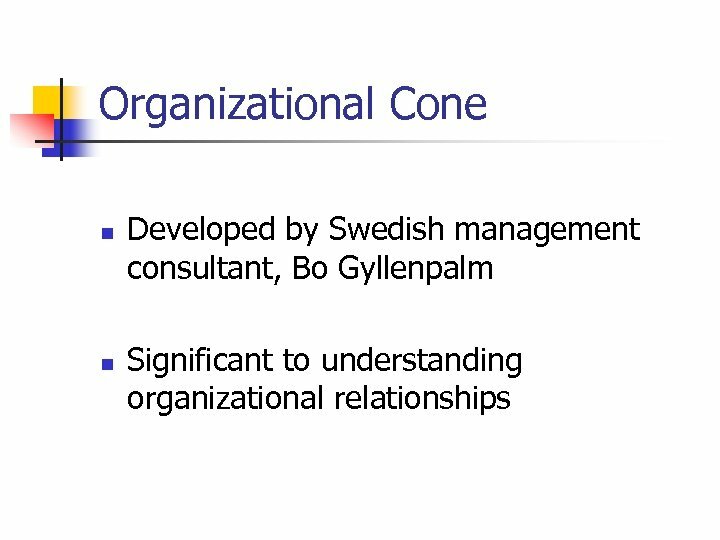 The best results are obtained when there is some overlap between departments and/or teams. 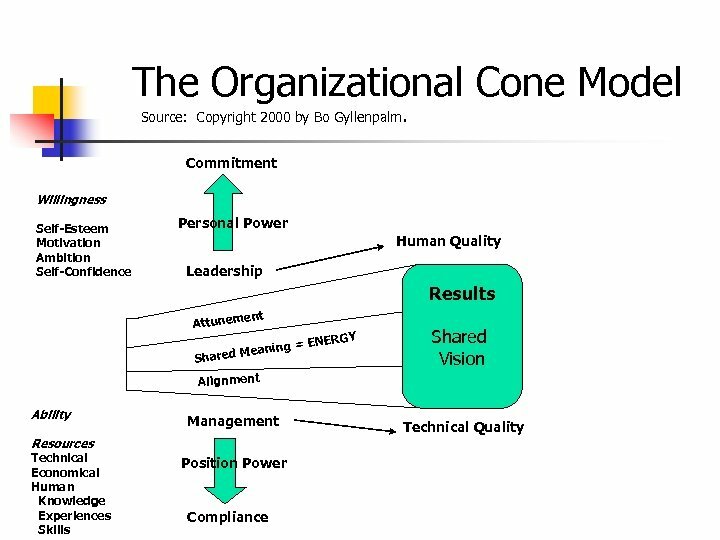 Energy n n Leaders should make sure the cone is focused and well defined. 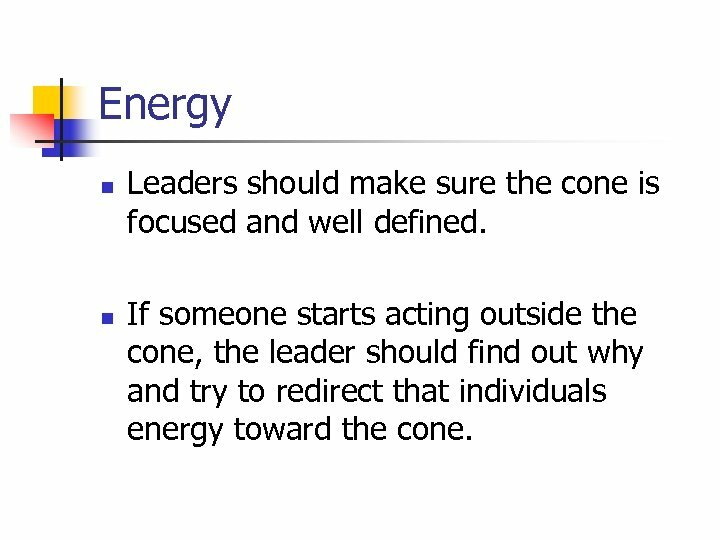 If someone starts acting outside the cone, the leader should find out why and try to redirect that individuals energy toward the cone. 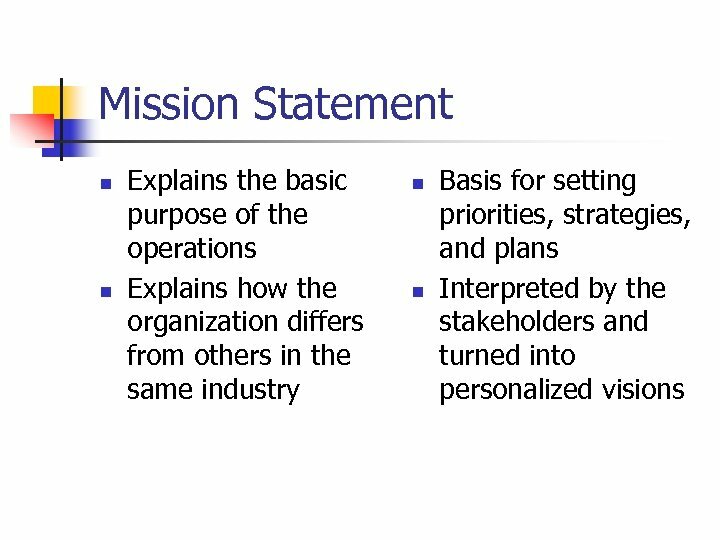 Mission, Purpose, and Stakeholders n n The purpose or mission of the organization should be well defined to all stakeholders in order for them to buy into it. 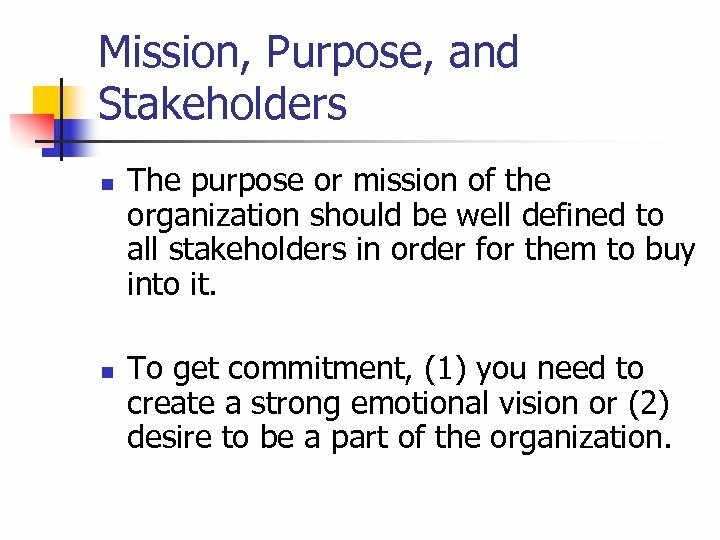 To get commitment, (1) you need to create a strong emotional vision or (2) desire to be a part of the organization. 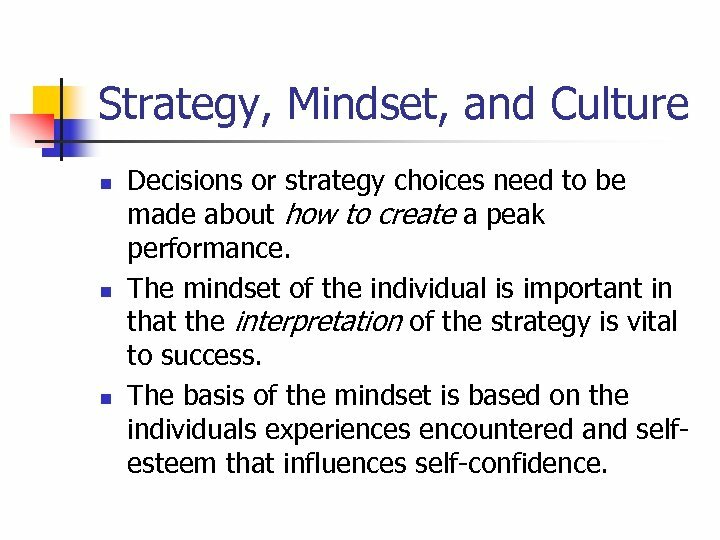 Strategy, Mindset, and Culture n n n Decisions or strategy choices need to be made about how to create a peak performance. The mindset of the individual is important in that the interpretation of the strategy is vital to success. The basis of the mindset is based on the individuals experiences encountered and selfesteem that influences self-confidence. 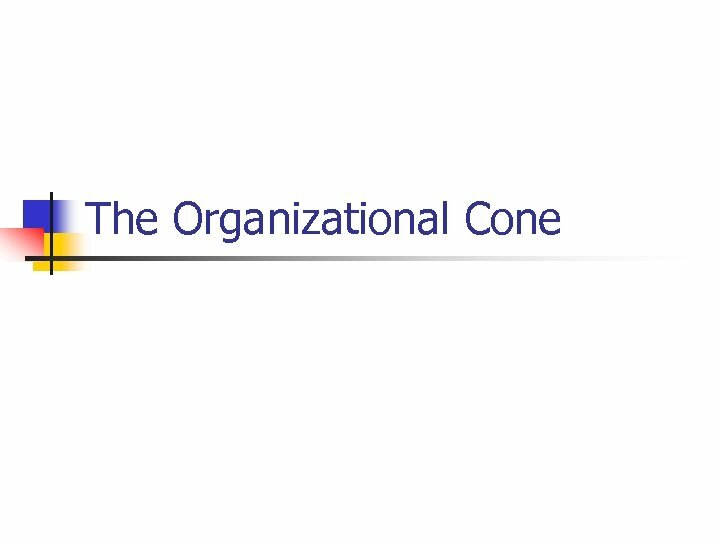 Strategy, Mindset, and Culture n n The existing organizational culture is the result of implemented decisions that have shaped the organization’s way of thinking and operating. The culture must be “in tune with” the strategy. 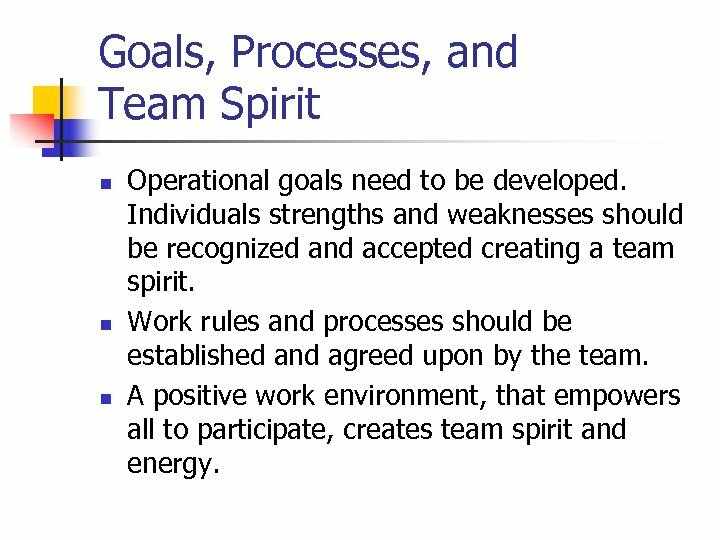 Goals, Processes, and Team Spirit n n n Operational goals need to be developed. Individuals strengths and weaknesses should be recognized and accepted creating a team spirit. Work rules and processes should be established and agreed upon by the team. A positive work environment, that empowers all to participate, creates team spirit and energy. 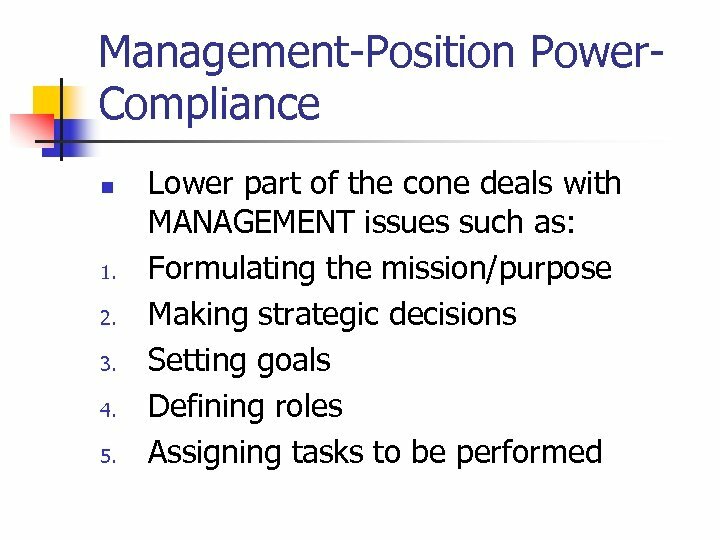 Management-Position Power. 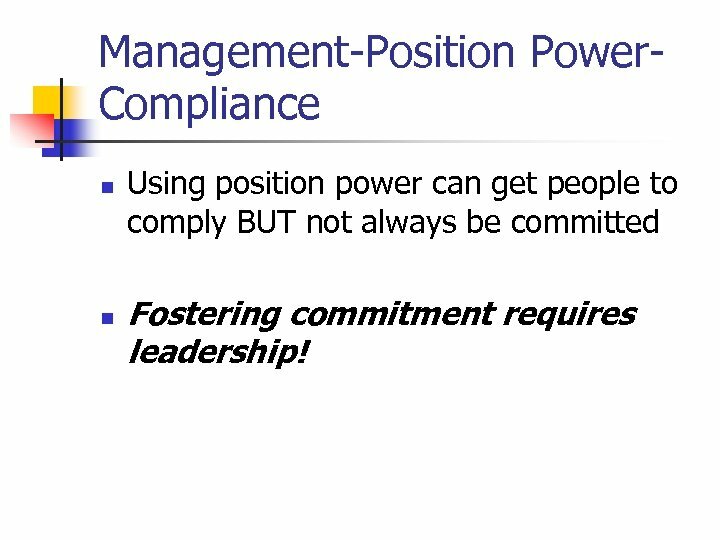 Compliance n n Using position power can get people to comply BUT not always be committed Fostering commitment requires leadership! 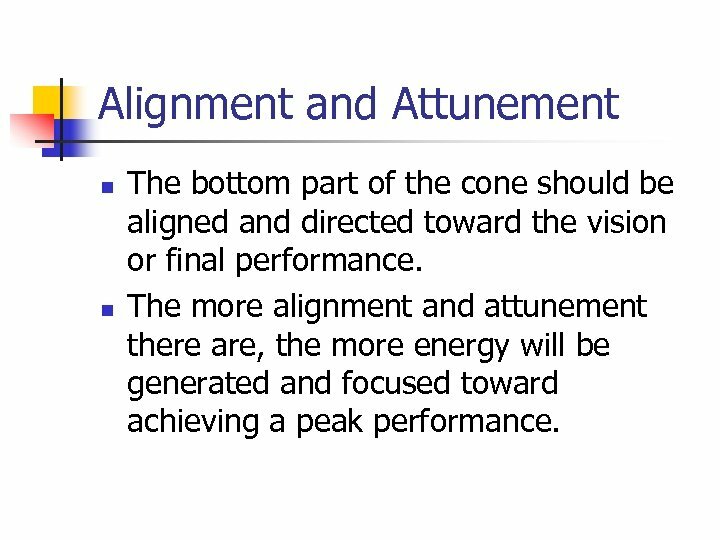 Alignment and Attunement n n The bottom part of the cone should be aligned and directed toward the vision or final performance. The more alignment and attunement there are, the more energy will be generated and focused toward achieving a peak performance. 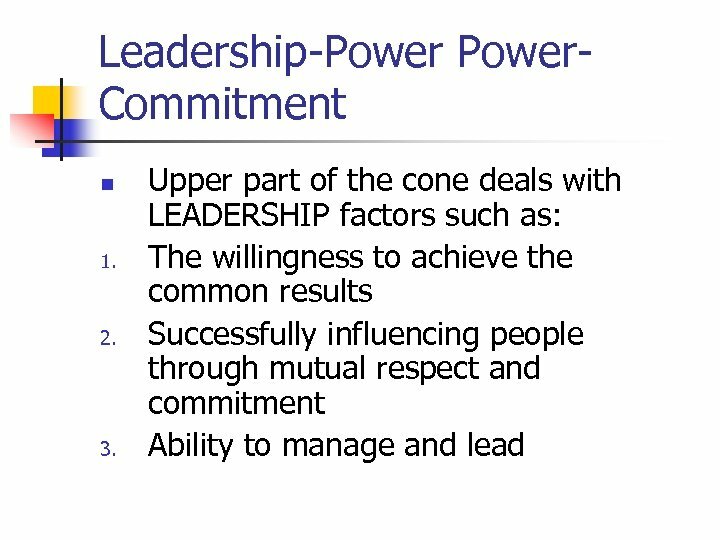 Effective Leadership n n 1. 2. 3. 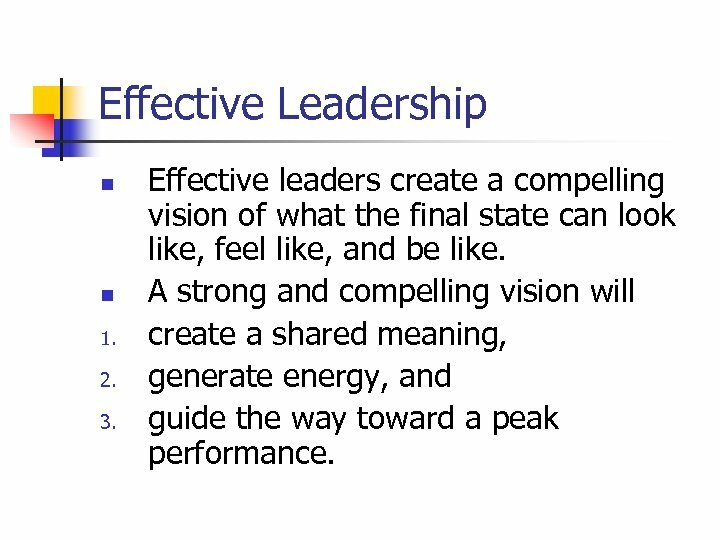 Effective leaders create a compelling vision of what the final state can look like, feel like, and be like. A strong and compelling vision will create a shared meaning, generate energy, and guide the way toward a peak performance. 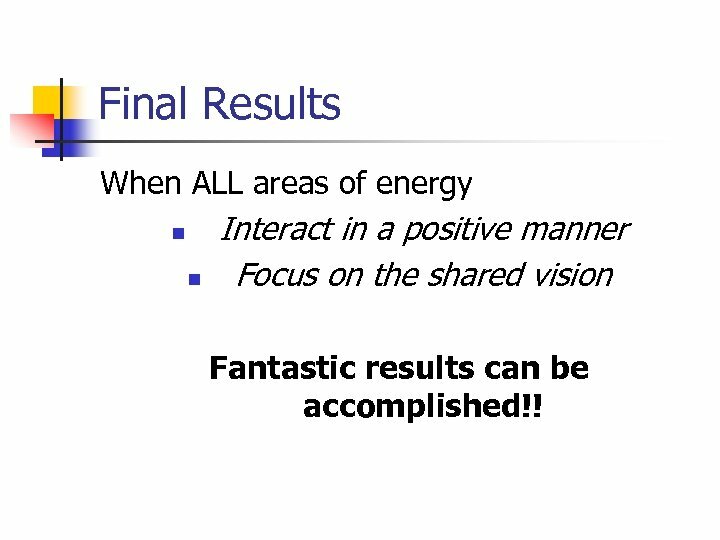 Final Results When ALL areas of energy n n Interact in a positive manner Focus on the shared vision Fantastic results can be accomplished! !